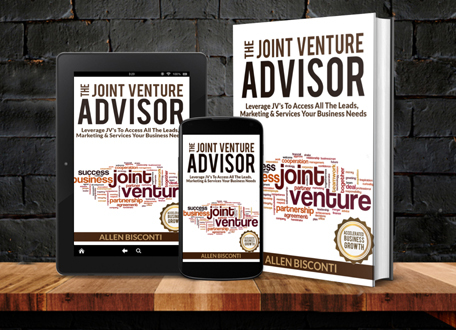 For 20+ years I’ve been utilizing joint venture & strategic alliance partnerships and trade to build my companies and have been providing companies with the marketing resources/contacts they need to acquire leads and services at huge discounts or on contingency. One of my companies provides leads via subscriptions which saves companies a lot of money. My data company provides millions of Internet leads throughout the month to companies, I use JVs, trade and buying in bulk, a combination that sets me a part from others in the joint venture and Internet marketing niche. I have access to just about every service your business needs online at discount or via revshare and have been the facilitator of numerous successful deals that have helped companies grow faster without risk, some deals involving celebrities, popular authors, Fortune 500 companies and other big names. If your company needs an advisor (guidance & resources) to assist with identifying JV partners, new cash flow streams, monetizing your existing leads and resources, bonuses to add to your existing services to increase sales and retention, to strategize, etc contact me ASAP. Setup a call by going to www.allenbisconti.com or email at ceo@invisionholdings.com..
• IP & Social Media Appending, SEO, Email Hygiene/Verification, Etc. I’ve owned several Internet companies that I’ve built via my resources, JV’s, etc. I have also helped several other businesses over the years. I have numerous relationships that allow me to provide unique deals to my clients that they couldn’t get if they went direct and I know which sources are the best at any given time. Internet leads generated for you via a set monthly subscription (set budget) instead of paying per lead. I’m good at spotting potential joint venture partners for your company and unlike other Internet business Advisors, I have assets to contribute to your company (data, etc). Invision Holdings Inc gets in the largest lead volume in the industry which makes it the logical choice as a one stop data source for companies. Business & consumer data feeds, millions of leads coming in through out the month via daily feeds. Instead of charging per lead like most companies, Invision Holdings charges a set monthly licensing fee to access all or parts of the feeds. The best leads are all of them! These data feeds are great assets to use in joint ventures and strategic alliances and help Allen when it comes to setting up joint ventures for your company, it’s just one of the many assets/services he can contribute. "Adding your leads and services to our membership will definitely help increase sales and retention!" "You guys get more Internet leads than any company we've ever dealth with"
"Implementing your strategy of using joint ventures instead of doing it all myself has led to less work and more cash flow!" W.P. "I would have never thought to do a joint venture with the best selling author I helped. Now I can JV with him to endorse my new book and course for faster sales." S.K.